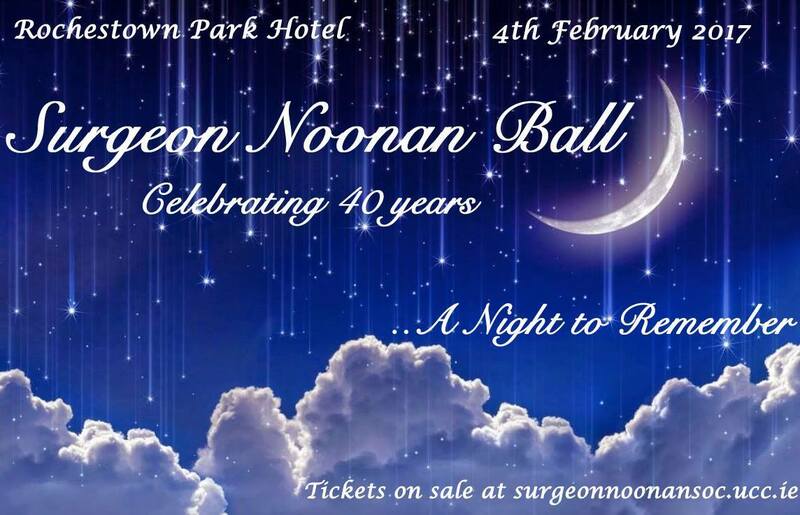 The much anticipated annual Surgeon Noonan Ball is set to take place on February 4th 2017. The Rochestown Park Hotel will play host to the society’s 40th anniversary, ‘A Night to Remember’ and UCC’s Surgeon Noonan Society wishes to invite all members of the local community and beyond to come together to dine and dance the night away. The evening will commence at 6pm with a welcoming reception. Thereafter, everyone will be seated to enjoy a stellar five course meal, followed by our raffle, and an opportunity for whirling and twirling to the music of the nationally acclaimed Cork Pops Orchestra, conducted by Evelyn Grant of RTÉ Lyric FM. The funds raised from the ball, along with efforts throughout the year, will directly assist the hospitals which our students volunteer at in Malawi, Zambia, Tanzania, Kenya and Ghana this summer. Tickets and details of the ball can be found on the society’s Facebook event page and on our website at surgeonnoonansoc.ucc.ie. Our email address is surgeonnoonan@gmail.com for those of you would like to contact us directly. The society would like to extend a sincere thank you for the patronage and encouragement continuously received.